BLEMISHED PRODUCT – May have scratches, scuffs, other cosmetic defects. Still guaranteed to function as normal. These handguards have “T-marks” (white numbers) on the rails. Our signature rifle-length free float quad rail – the AT3 Tactical Pro Series 12.5″ Free Float Quad Rail. Rail height perfectly matches an AR-15 flat-top upper receiver – your optics, iron sights, and other accessories will line up perfectly. Unique low-profile design – taller than it is wide (see pictures for exact dimensions). This makes our rail extremely light and easy to grip. Precision milled MIL-STD-1913 (picatinny) rails on all 4 rails. None of the sharp edges that you will find on inferior rails. Vent holes that run alongside the gas tube keep the rail cool, even after a long day at the range. Hardcoat anodization provides a durable surface that resists scratches and matches your existing parts. 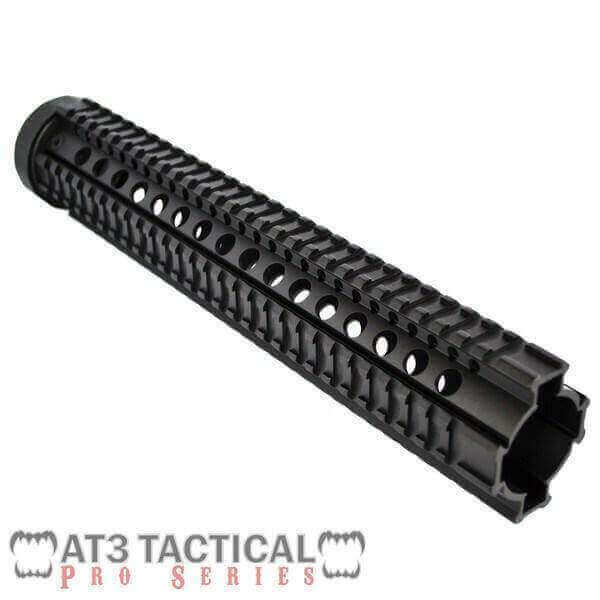 The Pro-Series Quad Rails are AT3 Tactical’s most popular products – 5-star reviewed, top-tier AR-15 quad rails at great prices. Full kit – includes all mounting hardware as pictured below. Installation is simple, just replace your current barrel nut with the nut we provide. Please Note: These quad rails are made for standard AR-15’s. If you have a 7.62/.308 AR variant, check our our AR-10 / 7.62 / .308 page. Q: How do I know if this will fit my AR-15? A: This will fit any AR-15 that has a standard mil spec upper receiver. It will require some modification to your firearm though, including replacing the barrel nut, removing the flash hider, and possibly adding a low profile gas block. Want to learn more? Watch the installation videos. Q: Do I need to buy anything else? A: For longer handguards you may need to replace the gas block or front sight with a low profile gas block, available here. These gas blocks are low enough to sit under the quad rail. You will also need to get an armorer’s wrench for the barrel nut, and we highly recommend a vise block to hold the upper receiver in place while you work on the weapon. Get armorer’s tools here. Q: Will this work with my AR-10/.308? A: No – these quad rails are made for standard AR-15’s. If you have a 7.62/.308 AR variant, check our our AR-10 / 7.62 / .308 page. I am very glad and well pleased with the Quad Rail I purchased from AT3 Tactical. I also especially appreciate the on-line video which helped tremendously in my installing it. Now it is installed and it is rock solid, there is no way I can move or jiggle it. Even though it was listed as Blemished I have not been able to discover anything Blemished about it.